Our Class has unequivocally opposed the neo-liberal reforms set in motion aggressively from 1991 to this day. We have struck 14 times through General Strikes against these “reforms” which are nothing but increased poverty and penury for the vast majority of the working people of this country. Yet the ruling regime, firmly in the grip of MNC’s, Capitalists and their Mafiosi Media is galloping in full steam to dismantle every brick and stone of the Welfare State edifice that was envisioned in the Constitution of India. The last general Strike of 28th February 2012, which saw the mammoth participation of more than 10 crore working people across the length and breadth of India, should have warned the UPA and other State Govts. to beat the retreat, but instead in the last 12 months, we have seen the most pro-capitalist and slavish economic and social legislations and ordinances pushed through in the parliament and in various state’s assemblies to burden us with the growing and unbearable economic hardship. Every essential commodity and services that our class uses from Tea to Textiles, Schooling to Transport has seen an exponential price rise week after week in the last two decades. 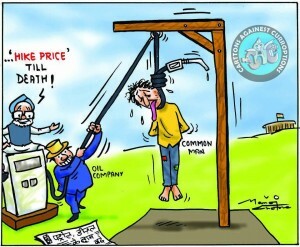 Inflation and high prices have become like an economic cancer that has no cure whatsoever. Yet while the purchasing capacity of the ordinary people is dwindling resulting in less calorie intake for the masses, but the number of dollar billionaires is ever increasing in the country. The Congress party and their cohorts, in their servile effort to appease their imperialist donor and financial institutions; IMF & World Bank are attacking life and the living standards of the working people and the down trodden in every imaginable way. The much touted FDI in retail is going to put 44 million out of work and push them to further poverty. It is high time that all the so called opposition political parties are called by their real name, they are no different to the aggressive neo-liberal Congress. There is not a single political party in the so called main stream politics that will oppose neo-liberal policies. Can the BJP and Modi, Akhilesh Yadav of Samajavadi Party, Mayavathi, & Mamata be taken to genuinely oppose the big business? Will the corrupt DMK & equally dishonest AIADMK with all their pretensions of being pro-poor declare that they are opposed to capitalist policies. We have seen how these essentially capitalist parties have behaved in relation to the issue Nuclear Plants, where they chanted the same rich man’s mantra of development which is nothing but the destruction of the poor people’s lives . The ruling class and their political representatives in various bourgeois and petty bourgeois parties unabashedly still talk the language of the growth, GDP and development when 836 million of Indians still earn a paltry sum of Rs.20 a day. The powers-that-be totally hide the startling facts about the OTHER INDIA that is engulfed in malnutrition, squalor, disease and poverty. The fact remains that, while the growth in the last decade has benefited the MNC’s, the Indian Inc. and the upper sections of the Indian society; but this has not benefited the Indian working people in any tangible way. The liberalization of the economy in the last two decades has not improved any of the social indicators or the agricultural sector that has been characterised by low growth and farm suicides (250,000 in the last 15 years), and India having more poor people than all of sub-Saharan Africa. India’s growth story, if anything, has been anti-people and anti-poor. The increasing communal-ism, caste atrocities on Daliths and religious minorities and the perpetuation of shameful acts of violence on women through out the country is nothing but the utter failure of Capitalism in India. The capitalist class that is linked to the vestiges of feudalism is incapable of solving the fundamental problems of this vast country. This General Strike of 48 hours is happening at a time when the world capitalism is suffering its worst moment in recent history. The so called success stories of Capitalism are down to dust. From America to Europe, Middle East to West Asia the authority of the ruling classes is increasingly getting challenged by the ordinary working people of these countries. The tumultuous events in Tunisia, Greece and South Africa are indications of working class flexing its muscles collectively and forging a way forward in the creation of formidable alternatives that will challenge capitalism and replace it with democratic Socialism. the utter failure of Capitalist System. Poverty Wages for the vast majority of the working people. Unemployment and privatisation that cuts jobs and services. 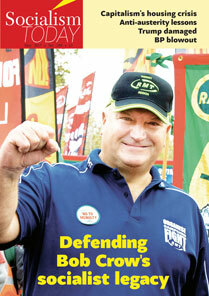 For re-nationalisation of all privatised industries and public services. the system that failed to provide health, education and shelter for all. Atrocities on Daliths and Adivasis and rising communal-ism. Sexual Violence and against the system that perpetuates patriarchy. the Nuclear Plants of Kudankulam, Jaithapur and other places. The working class of India along with the other sections of the down trodden is the only progressive force that can challenge capitalism and put an end this oppressive system. A fighting, militant, combative approach is the only way forward for the working class to collaborate with struggles of the women, students, Urban and Rural poor, of the Adivasis and Daliths for a stronger alliance linked to the programme of the Socialist transformation of the society. 28th February 2012 General Strike: Capitalism is THE CRISIS dump it ! 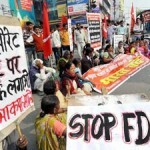 Bandh against FDI invasion is Necessary, but…..what Next? Oppose FDI in retail – Don’t Let the Fox in!